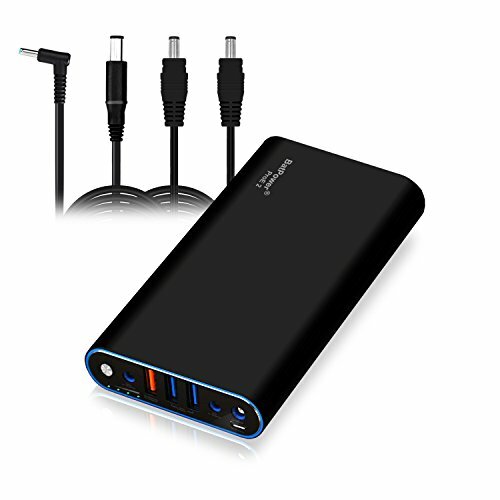 NOTE: This item NOT AN PD USB-C Portable Charger or Power Bank for HP Laptops, if needed please place separately order for BatPower TPC or EM3 USB-C Converter, it will works well for your USB-C laptops. 1x QC 3.0 USB Port output 5V/9V/12V 18W Fast charging for Quick charge tablets and smartphones. 2x USB A Ports Output 5V Max 24W Charge for tablets, smartphones and more 5V USB Charging Devices. Faster and safer charging with our BatPower leading technology. At BatPower, we believe in our products, all products keep 18-month warranty, easy-to-reach support. DC output Port 20V-15V(Max 90W), QC USB Port output 12V-5V (Max 18W), USB AQ Ports output 5V (Max 24W), Led flash light output 5V(1W). DC Input Port: 16.8V-20V (Max 90W), Mini USB Input Port: 5V (Max 15W). Approach 1.5 times Charging for an 13-inch laptop, 6 times for iPhone X. Recharges in around 2.5-3.0 hours full charge via the BatPower Adapter, 8-12 hours full charge from a 5V Micro USB adapter/charger. Package List: BatPower EX7H Portable Charger, Fast Charging Adapter, DC to 4.5x3.0mm Charging Cable(Small Circular Connector / L=5FT), DC to 7.4x5.0mm Charging Cable(Large Circular Connector / L=5FT), Micro USB Charging Cable, Protective pouch and Instruction Manual; Size: 7.2 × 3.2 × 0.7( inch), 18(oz). If you have any questions about this product by BatPower, contact us by completing and submitting the form below. If you are looking for a specif part number, please include it with your message.